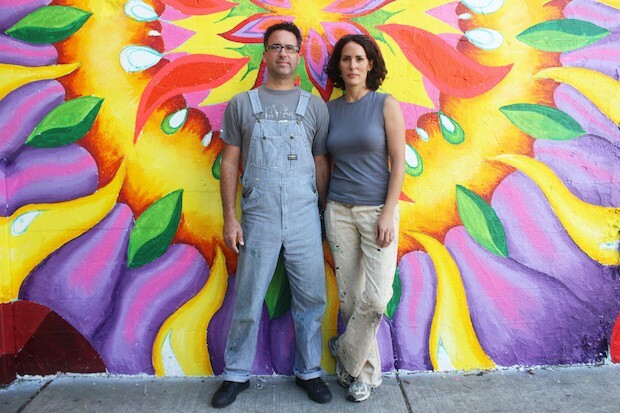 Mix Masters Murals is the creative collaboration of husband and wife team Dustin Harris and Lea Pinsky. Together, we have a passion for working for and with communities to beautify spaces with large scale artworks. Since 2005 we have led numerous large-scale mural projects in schools, community centers, and public spaces around Chicago. Projects include CTA El walls, the Fourth Presbyterian Church downtown, four Chicago Public Schools, Columbia College Chicago, the City of Evanston, and community parks. Since 2009, we have also served as Lead Project Managers for the Rogers Park Business Alliance’s “Mile of Murals”, which annually creates a new block-long mural for the Glenwood Avenue CTA walls, each one 2200 square feet. As Project Managers, we have devised themes for each wall, led rigorous selection processes, supervised 13 professional artists in their designs, managed budgets, and overseen painting from start to finish. In 2016, we developed new public art initiative called the Evanston Mural Arts Program, as a program of local non-profit Art Encounter. EMAP provides curatorial leadership and project management support across all areas of making public murals, towards the shared goals of community enrichment, civic engagement, economic development, and beautification. Beyond our mural work, Dustin is a deejay and Lea is an arts educator. Justin Wynn Fund Mural, 2012. 25th Anniversary mural. Theme: community service youth program. Boone Elementary School, 2007-10	Playground, History, Lunchroom. Various Themes. Dustin Harris and Lea Pinsky, info@mixmastersmurals.com.